I call ’em Angeled Eggs. I can’t help it. I mentioned before that I have a pretty hard time calling these pretty little eggs…deviled. I’m pretty sure eggs don’t really care. I just think that “angeled” sounds nicer. Have you ever taken Angeled Eggs to a potluck? It seems that they are one of the most popular items. They’re GONE before Great Aunt Edith’s chocolate pie – and that’s saying something! Plus, they are very inexpensive to make! Put the eggs in a saucepan with enough water to cover them. Remove the eggs from hot water immediately and place them into a bowl of cold water. Peel the shell off the egg. 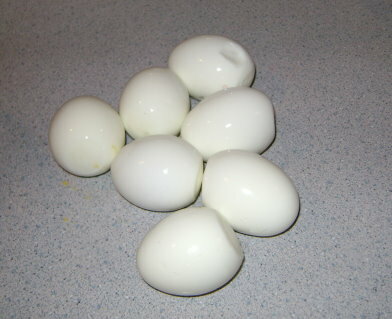 Cut each egg in half and place the yolks into a bowl. Mash the yolks with a fork, then stir in the mayonnaise, mustard and onion salt until smooth. Fill the whites of the eggs with yolk mixture using a spoon or a fancy cake decorating tool. mustard and onion salt until smooth. Fill the whites of the eggs with yolk mixture. I used my handy Pampered Chef cake decorator which makes these eggs SO pretty. Plus, the chickens must be really excited about spring because they are laying eggs with SUCH yellow yolks! Lovely! I love how angeled eggs are a perfect picnic or potluck food – and how they compliment so many spring and summer time meals! And they’re so easy to make! Oh, the cheese crackers please. I would love to make my own. Definitely the homemade cheese crackers! I would like to see the cracker recipe. I made your chocolate pudding last night when we had friends over for dinner. They were astonished at how delicious it was and were even more amazed when I said there was no sugar but instead it had maple syrup. I love showing people that there are yummy desserts that don’t contain the dreaded white stuff – sugar. Thanks so much! Mmm…this is how I make “Angeled eggs” too! And for a fancy finishing touch, sprinkle a little paprika on the tops! I would like to see the cheese crackers, please! Yes this is one of my favorite egg recipes :) Sometimes I sprinkle paprika over the top! I would love to see the homemade cheese crackers, this is one thing I have been wanting to make myself! One of our fave kinds of crackers are chicken in a bisquit and I was thinking by adding chicken broth to the cracker dough…it might recreate them! What do you think? I would love to know how to make our own crackers!! Mac n’ cheese! Mac n’ cheese! I’ve always felt funny calling them deviled eggs as well, but never came up with an alternative. I like your “angeled” eggs. Cute! They are one of my absolute favorite dishes to bring to potlucks or when I need to supply a snack for a church even, baby shower, etc. Cheap, easy, yummy, healthy! Hmmm, both recipes sound yummy, but I’m going to say mac and cheese, because that’s a family favorite and I always like to find different versions of it. little (homemade) dill relish to them and sprinkle some smokey paprika on top. They have to make an appearance at all the major holiday get togethers for the family and have had my son-in-law order a dozen eggs just because. Does a mama proud! I’m the only one in my family that likes deviled eggs. Do you think if I make angeled eggs they will like those better? I vote for the cheese crackers. Yum! We love angeled eggs. :D I agree they are usually one of the first to go for potlucks. LOL! Mac and cheese please! I just swore I’d never buy another box of it again and wouldn’t you know it DH wants some! I would love to learn how to make it myself. Those eggs are SO pretty. I never thought about doing them this way. I would love to see the Homemade Cheese Cracker recipe please. Cheese crackers… I’m still trying to find a happy medium with my cracker obsession. Oh they look so lovely. I am so going to try this. Thanks so much for the food inspiration. :) Much appreciated. Both please. Alright. The mac n cheese. Only because I have loads of mac noodles and need to use them up. I always find it funny the things kids say. One day a couple months back my oldest (8) asked me for those eggs. It took awhile to figure out what she was talking about. They are white and yellow (that helps…a little) but the yellow is different. the final thing that helped: “I think they are called delivered eggs, mom” So now that is what they are called in our home. Could be the pentecostal background, could be that they are delivered right to the table…regardless they are enjoyed frequently at our house. I boil my eggs for 2 mins then leave on the stove for up to an hour. 20 mins is usually the perfect time to get them off the stove. We don’t mind the greenish look. so i’ll leave them on the stove for an hour or so. I run cold water over them until cold, and then roll *smash* them, around, the crack easy and peel super easily! I love to add tuna to my eggs. Love your blog! I’d love for you to come by sometime and check mine out. I also noticed that you had kiddos…..we participate in a fun event called Muffin Tin Monday. You should join us! The link is on my blog. How funny ! We call them in France : oeufs mimosa, that is “egg mimosa”, because mimosa flower-heads are bright yellow, just like your egg yolks ! But I like your “angeled eggs” Have a wonderful day ! Those look really good!! Simple always tastes so good!! Instead of plain old yellow mustard, I use Mustard w/horseradish along with mayo, salt, pepper and McCormick’s “Salad Supreme”. Then I sprinkle paprika on the tops. The addition of the taste of horseradish and “Salad Supreme” seasoning give them an extra “kick”. When I boil my eggs, I add just a bit of white vinegar. This makes me soooo easy to peel. My mom has the family’s fav recipe for deviled eggs. In the egg yolks we add mayo, mustard, johnny’s seasoning salt, mrs. dash, and lemon pepper. Fill eggs. Sprinkle top of eggs with paprika (makes a cool dusting of red on the eggs). She uses the egg trays you can buy at easter time (clear or white) and puts a small bowl of olives in the middle (prefect lunch tray if you ask me) and stacks them to take to potlucks and the like. Same ingredients with potato salad, but we add sliced black olives and cubbed cheddar cheese to it (and I just thought of jalapenos for my husband). Absolutely yummy. We like to put paprika on ours. yuuuum! Love those “angeled eggs” (especially the Pampered Chef touch)! Ever thought about adding haloes? I learned from my mother-in-law to put a sliced olive ring on top (usually black olives; sliced red-and-green pimiento olives for Christmas). 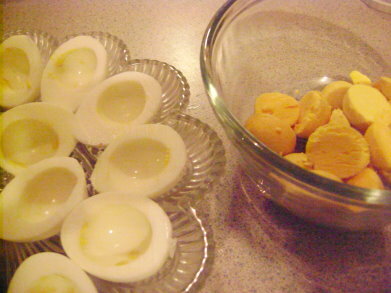 That makes a halo for your deviled eggs, and is a special touch for potlucks, too. 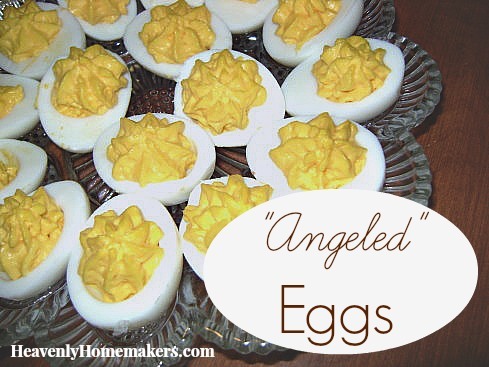 Oops, I meant that the “halo” is for your ANGELED eggs, not deviled!! A friend of mine from church just shared your website with me. I am loving it! 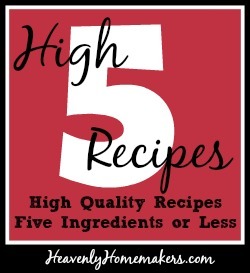 Love all the recipes too. Just wanted to share that our family doesn’t like the term “deviled” either so we always called them “angel” eggs..
We call ’em inside out eggs! Seems to flow a little easier than “angeled”. They’re only called “Deviled eggs” if they have pickles in them. Without pickles, they’re “dressed eggs”–so yours aren’t devilish at all. I love deviled eggs. My hubby, however, hates all eggs, so I only get these at potlucks. Boo. I know I may be the only person interested, but I love, love, love knowing the origins of foods. Apparently these eggs date back to Ancient Rome. Does that count as traditional food? going to make these for a family get together. My first attempt at making angeled eggs! I’ve seen them mentioned several times in menus or events you do, but never had the occasion to make them myself. We raise our own chickens on rotated pastures, so I think they are going to be good no matter what I do. Thanks for sharing your recipe! My mon has always made hers with some pickle juice added in, makes them perfect! My dad renamed these Angeled Eggs because he said nothing that good should be named after the devil. What a pleasure to hear another family uses the same name!